What is the difference between adherence / medication adherence / compliance / persistence in taking medication? “Adherence” is the extent to which a person’s behavior- taking medicine, following a diet, or making healthy lifestyle changes- corresponds with agreed-upon recommendations from a health care provider. “Medication adherence” is the patient’s conformance with the provider’s recommendation with respect to timing, dosage, and frequency of medication-taking during the prescribed length of time. “Compliance” is the patient’s passive following of provider’s orders. “Persistence” is the duration of time a patient takes medication, from initiation to discontinuation of therapy. 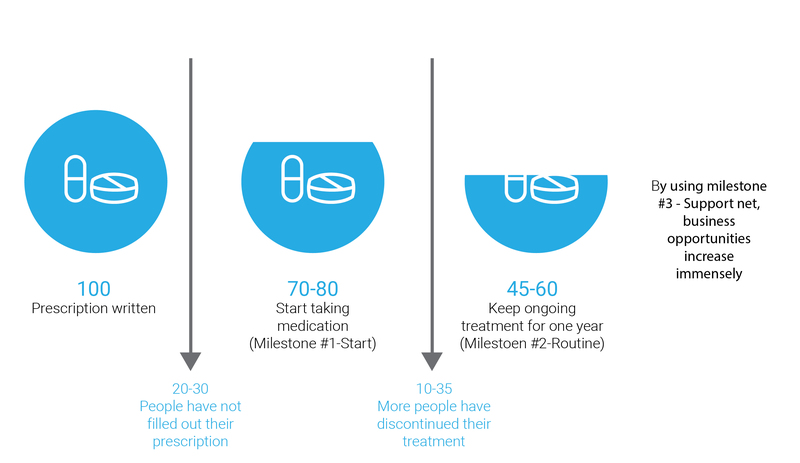 The patients start taking medication – A lot of patients purchase their prescribed medications but don’t ever actually start taking the first pill; but, by doing so, the patient takes the first step towards adherence. patient – Basing a routine means creating a regular medication intake regime according to every patient’s specific needs (same time every day / with or without food and other supplements) it is possible to schedule different vital sign measurements if and when necessary such as: checking blood pressure, glucose levels, oxygen levels, weight, etc.). After about two weeks of a successful process, you may conclude that a routine process was based. Creating a support net – for the patient makes the difference between being “compliant” (having the patient play a passive part in the process, therefore it will be less likely for him to stay adherent longer) and becoming “adherent” (encouraging the patient to take initiative and play an active part in his medication adherence). A support net can be portrayed as caregivers / family / friends that can be notified of non-persistence and get the patient back on track. From the get-go, a support net is crucial so that the patient understands that he is not alone. This will create a greater importance in taking the medication. As all know, the Improvement of treatment compliance yields the greatest gain both in effectiveness and efficiency. By monitoring the patients’ adherence, especially by acting according to these three milestones, the chances for the patient to improve his/her life quality, reduce care costs and utilize his/her care regimen to the fullest, grow immensely. All patients in the following suffer from the same chronic conditions, take the same prescriptions. 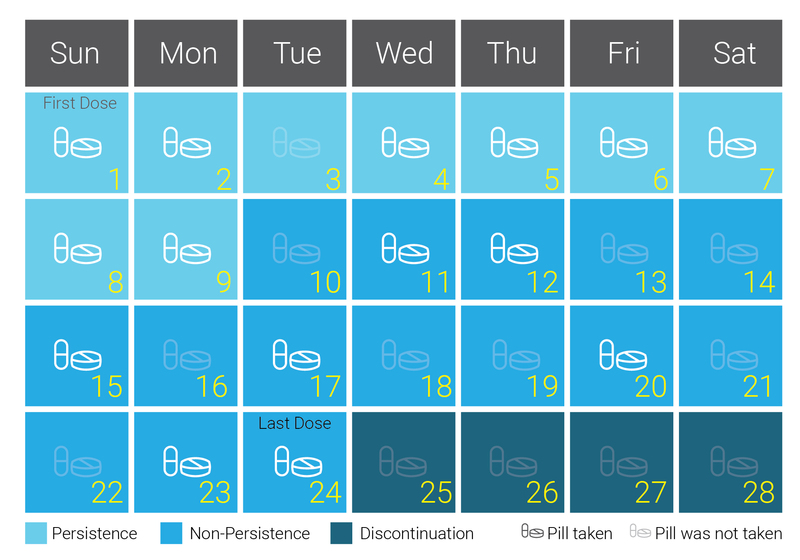 Each patient took 82% of prescribed doses, in a course of a month. The effect on each of these patients health would be different, so in order to create an effective support net, it will be necessary to address each problem differently; this is only possible when knowing what the specific problem is, and the only way to do so is to gather information into organized reports. Moreover, it is crucial to understand that there are various reasons that lead to medication non-adherence, but the main reason is behavioral. 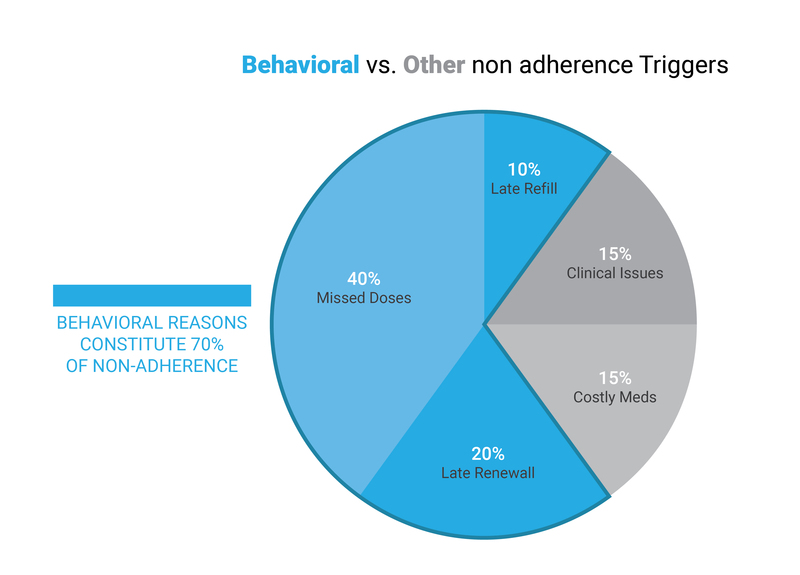 The behavioral reasons constitute about 70% of non- adherence and are indicated by: late refilling, late prescription renewal, and missing doses. Other reasons can be: clinical questions & high medication costs (less influential). 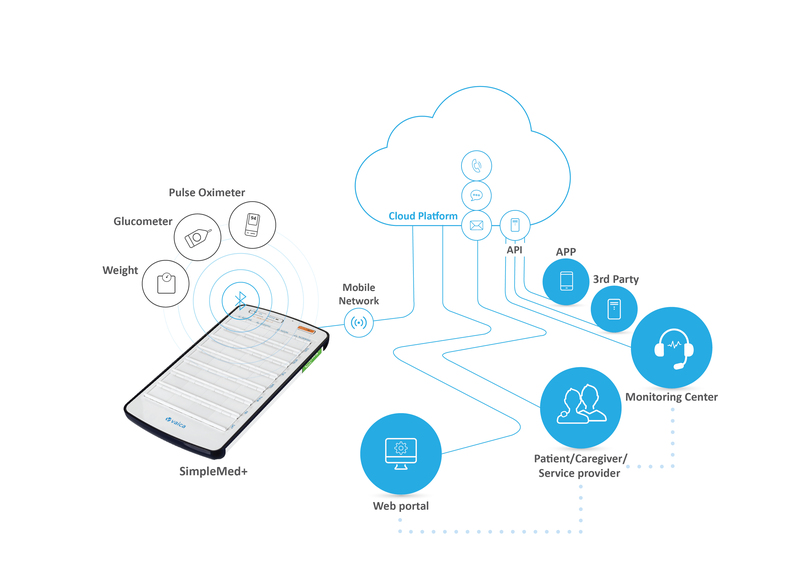 An everyday, ongoing connection between the patients, the smart medbox and the caregiver / healthcare provider creates a positive feedback loop that keeps the patient adherent and enables correct, real time intervention points if needed. A complete solution is required to do just that. The three milestones mentioned before are great intervention points where pharmaceuticals can examine, manage and eventually utilize their business opportunities. Eventually, the key solution is to manage, monitor & support patients’ adherence. It is no longer just the patients’ problem, it becomes a costly liability with a major economic impact on the family, caregivers, health institutions and healthcare providers. The whole system has to address patient adherence as a number one concern. After understanding this, How can we change the behavioral issues that cause non-adherence? Giving clear, explicit information (while addressing Literacy problems) – the patients awareness of the treatments’ importance begins at the caregivers / doctor’s office. The delivered information should be comprehensible to all socio-economical layers of the society. If a patient does not understand consequence on non-adherence, there will be no establishment of a sufficient reason to take medication as prescribed, or at all. Feedback– by measuring and consistently presenting the patient his adherence levels, it will immediately increase them. The patient needs to see the reflection of his true behavior and become aware in order to start treating it. 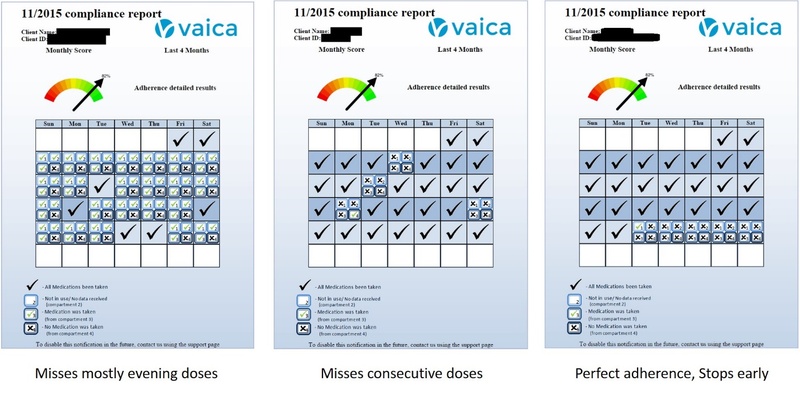 Mentally awarding system– there is a direct link between how well a patient does on his adherence record and how long ho will continue his med treatment. No one likes to keep doing something that he is not good at. This acts as a positive feedback loop- better adherence levels = longer adherence consistency. As long as we make sure that positive, rewarding reports are outputted, the positive feedback loop will help us keep up the good work. Creating a trigger– sometimes, it is easier to establish an intake routine by associating the intake times to a separate habit; this can be meal times, taking other measurements, a beeping sound or any other repeated, daily based activity. Setting clear goals– Goal setting is a major component of personal-development and management Studies by Edwin A. Locke and his colleagues have shown that more specific and ambitious goals lead to more performance improvement. As long as the person accepts the goal, has the ability to attain it, and does not have conflicting goals, there is a positive linear relationship between goal difficulty and task performance. Same action can be done after reviewing monthly adherence reports and setting a realistic yet challenging goal for the next month. It is possible to manage all of these issues (behavioral, milestones) and enlarge business opportunities in one complete system. This system answers the end user’s needs (the patient) as well as the caregivers’. It has a simple, comprehensive and smart medication dispenser that is especially designed for different types of patients with various medication modalities and is easily operated / programmed by the caregiver. It outputs real time alerts and messages so you can constantly but remotely care for your patient or contact his family. And most important- it gathers all medical information into one user friendly portal for milestone inspections, behavioral indication, etc’. It is simple to SWEETEN THE PILL – With Vaica. Pubmed.gov J Hypertens. 2001 Jan;19(1):149-55.Which is more important for the efficiency of hypertension treatment: hypertension stage, type of drug or therapeutic compliance?Mar J1, Rodríguez-Artalejo F.